Toshiba bring mid-volume workgroups impressive color and high-volume black and white, including copy, print, scan and fax capabilities. Now, thanks to the integration of the new generation e-BRIDGE platform, features can be added later—similar to the way apps are added to smart phones. This platform also provides increased security, connectivity, manageability and energy saving. Yet another technological advancement from Toshiba. Since today's MFPs are also used as IT devices, the new e-BRIDGE controller provides seamless compatibility with networks and management systems. Administrators can quickly and easily perform initial settings as well various management tasks such as those involving users throughout the system, targeted security, and multiple devices. They can also perform tasks that previously required a service technician like installing multiple systems, upgrading software using patches, cloning, and changing settings. e-BRIDGE allows for seamless integration with core business applications to streamline workflows. It allows you to keep up with changing technology, too. As new applications for advanced features and functions are developed, they can simply be added on. 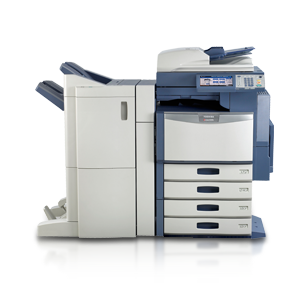 The e-STUDIO2040c/2540c/3040c offer high-speed color and black and white at speeds up to 30 pages per minute. An administrator can easily connect with multiple networks and their management systems. You can print on any current e-STUDIO series model without adding another driver and settings are easily applied to multiple PCs. An optional e-BRIDGE Job Point commands the distribution of print jobs of up to ten e-STUDIO models linked by a network. cassettes can be added as well as a 2,500-sheet tandem feeder. Using a 100-sheet bypass, the total capacity is 3,700 sheets from 4 different paper sources. You can print impressive full color banners, posters and signs up to 12" by 47". Finisher options include a 50-sheet multi-position stapling finisher or saddlestitched finisher for booklets up to 60 pages as well as a hanging finisher that staples 50 sheets and holds up to 1000 pages. Capture one or two sided originals at speeds up to 57 images per minute for monochrome or color, while the scanner detects the size of the original, determines whether it's in color or black and white, the Automatic Paper Selection chooses the proper paper size for output. An optional Fiery server includes innovative new features like EFI ColorWise, EFI WebTools and LDAP support as well as tight integration with several new proprietary Toshiba technologies. When installed as an option, you can easily output vouchers and invoices using normal copy paper from one drawer and colored copy paper from another for duplicate copies. This is a more economical solution to pre-printed multi-part forms. as Microsoft Word and Excel for the utmost in mobile user productivity. by simply plugging them in. Restore operation quickly with easily replaceable maintenance units. been halted because a certain paper size has run out.